To become a Foundation Patron, please contribute at least $4,000. You will receive a plaque of appreciation and recognition. You will also be recognized on this list, unless you wish otherwise. 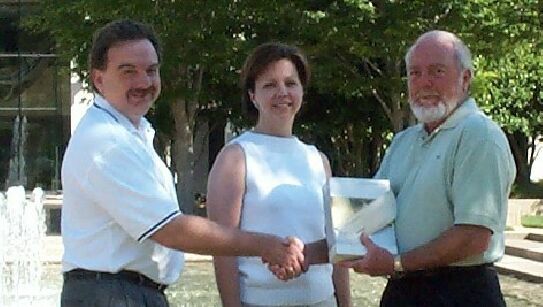 Carolina CAD Solutions, Inc. / Autodesk, Inc.
Foundation President Furmage presents CADRE Systems President Donnie Holmes with the Foundation Patron plaque at the 2002 NCSS Annual Convention Lunch Carolina CAD Solutions President Aaron Smith and Laura Quattlebaum with Foundation Director Mike Barr.